A spectre is haunting Edison – the spectre of Biryani. All the powers of Edison have entered into a holy alliance to expropriate this spectre: Punjabis and Telugus, Pakistanis and Delhites, Afghanis, Tamils and Gujaratis. 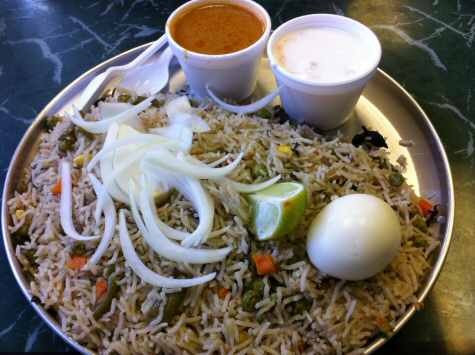 Never in the history of Edison and Iselin (neighboring towns in Middlesex County, NJ) has the craze for Biryani risen to such heights. 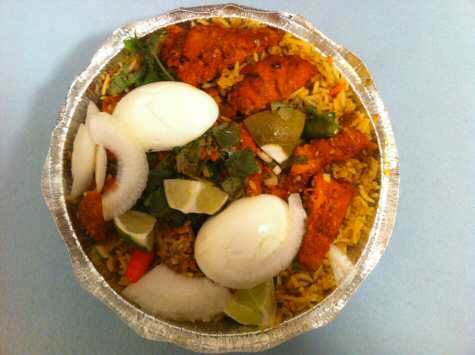 To be sure, Biryani is no stranger on the menus of Indian restaurants in Edison and Iselin. 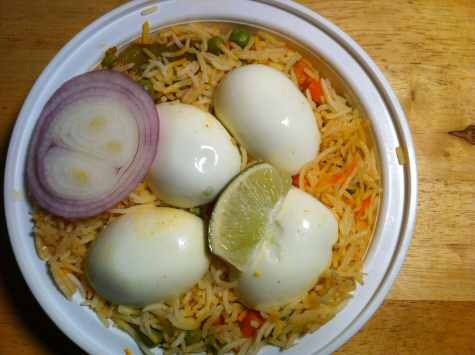 But it’s the recent invasion and colonization of Edison and Iselin by Telugus (a strange species local to the South Indian state of Andhra Pradesh) that has elevated Biryani to stratospheric heights on the menus and in the peoples’ imagination. 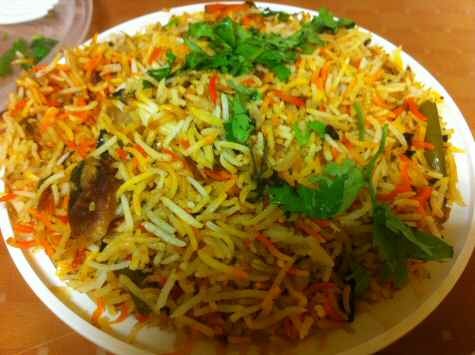 Until a couple of years back, the only Biryani in Edison, Iselin or any other town of New Jersey were the Vegetable and Chicken kind. 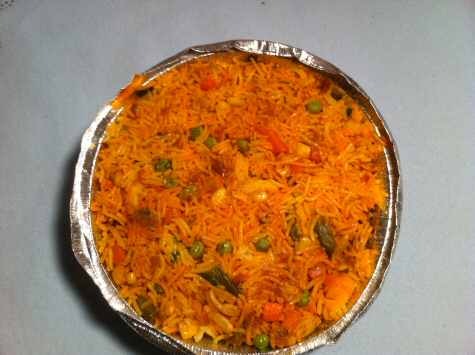 Now you have Shrimp Biryani, Goat Biryani, Lamb Biryani, Chicken Biryani, Vegetable Biryani and God knows what other variety of Biryani. 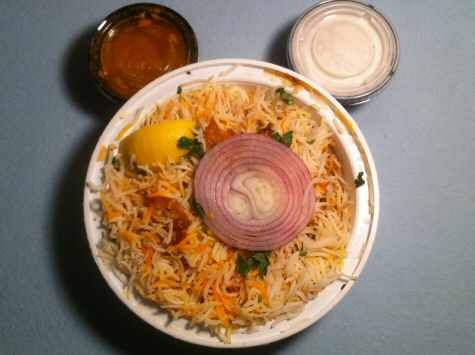 Above all, the hot favorite lately is the Hyderabad Dum Biryani, which supposedly uses steam as the technique of cooking. Of course, every Telugu restaurant these days has its ‘Special’ Biryani. 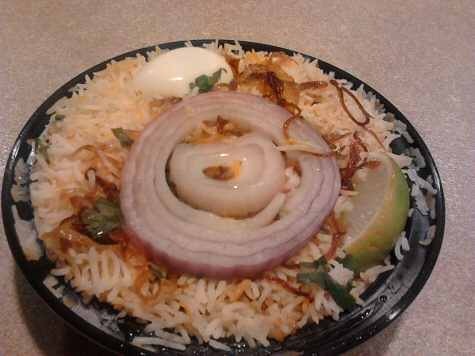 The mushrooming growth of Biryani restaurants (a lot of them owned by Telugus) in Edison and Iselin is a testament to the lack of ideas plaguing Telugu entrepreneurs in the U.S.
Is there nothing more to life than opening a Biryani shop, eating Dum Biryani and watching that shrieking baboon Allu Arjun’s movies? No wonder the majority of Telugus we’ve encountered seem like they belong to a different f*cking species, totally unrelated to Homo Sapiens! 4 Responses to "Indians Build Biryani Highway in Edison, NJ"
Read your review on Paradise Biryani Pointe on the Oak Tree Road web site. Even when I went there couple of weeks back for a takeout, the Telugu girl was rude when I gave my credit card. Apparently I cannot use credit card for orders less than $20. Since I was traveling, I asked if she could fill my water bottle. Another rude look – as if I told her to strip. How do these guys stay in business with such a poor service? Some times I feel ashamed to take my non-Indian friends to these places. On the contrary, during my travel I visited several Korean joints in Flushing, NY and the experience was heavenly to say the least. Impeccable service and great quality food. If you are a fan of Pork Belly, you should visit Han Joo Chik. The price was reasonable too. 1. You write: the Telugu girl was rude….Another rude look – as if I told her to strip. Personally, I think Telugu girls are sizzling. 2. We’ve been planning to revisit Flushing and the Main Street area for some time. It’s been over 5 years since we went there. When we visit Queens, we usually go to Jackson Heights because there are more Indian restaurants/grocery stores there. We’ll likely visit the New World Mall Food Court, Golden Mall and the street eateries in Flushing in October. I’ll try to sample the Pork Belly at Han Joo Chik as well. 3. Chinatown/East Village in NYC also has several good cheap eats! Went there about two weeks back. I’ll try to post some pictures tomorrow. Just that my current thinking is to keep the Indian and non-Indian stuff separate. 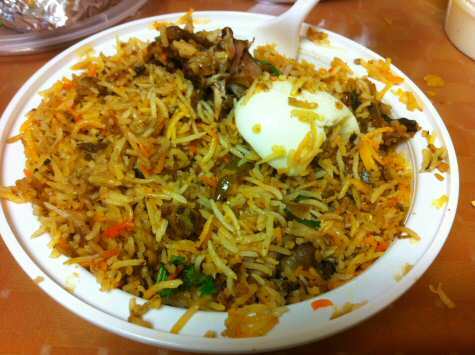 Biriyani’s galore…. quite a collection here ! Nicely done. A 4×4 grid of the pictures would be great and serve as my Biriyani Cliff notes. 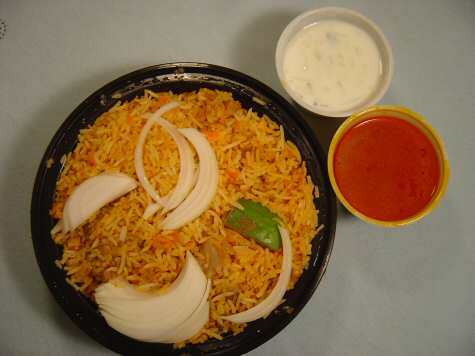 Recently found out that the famed Hyderabadi Biriyani seems passé in Tamil Nadu. It appears that the “thalappakatt (u/e)” variation is reigning supreme. Hopefully we can see someone bring it across the Arabian and Atlantic to the supreme eats of Oak tree road and Rt27 in NJ. This variety of Biryani seems to have originated in Dindigul, as per my InterNUT research. But I’m not clear how it differs from the Hyderabadi variety. Let’s wait for one of our Chennai Sapad Ramans (gluttons) to respond.